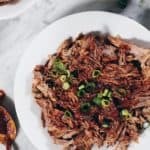 Whether you just got a new Instant Pot on Black Friday, or you’re just looking for new recipes to make in your old one, this Paleo, Whole30 + Keto mojo pork is about to rock your world! 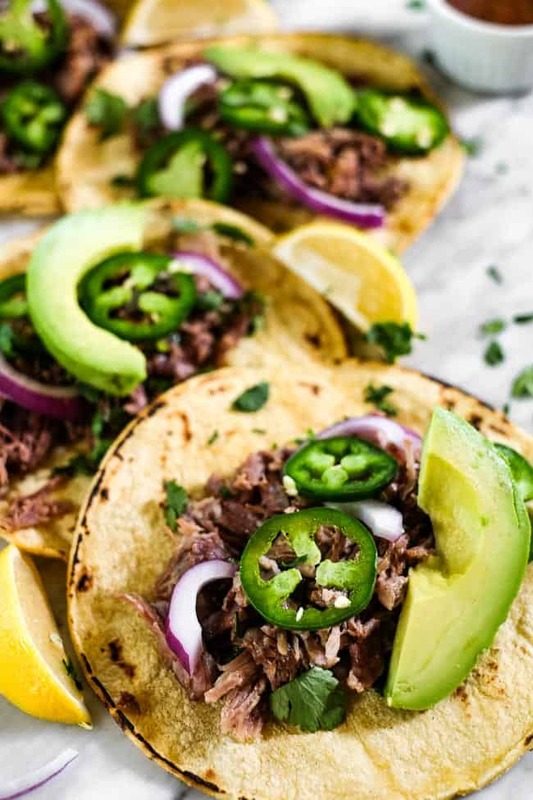 Not only is super tasty, it’s also super versatile and can be used as a protein in a variety of dishes. 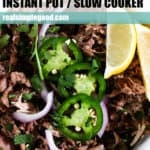 We also give you instructions for making it in both the Instant Pot and Slow Cooker. So…if you just got a new Instant Pot you might be a little intimidated (or a lot if you’re like us when we first got ours). You might even still be a little intimidated if you’ve had one for a while but haven’t played with it much. Don’t worry. We’ve got you covered. 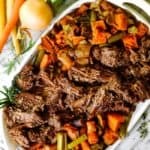 One of the best tips that helps to keep meats juicy and flavorful when pressure cooking is to first sauté. When you brown the meat a bit before pressure cooking, it really helps to lock all the goodness in and makes shredding once it’s done cooking easy! So, don’t feel intimidated. 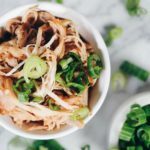 Follow along with the instructions below, and this mojo pork will definitely be an Instant Pot or Slow Cooker hit! 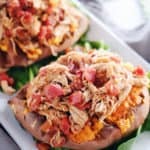 Seriously, there are SO many things you can do with this mojo pork! I bet you can even get more creative than us! We’d love to see how you use it and what you make with it. Of course, if you’re keeping it Whole30 or Keto make sure you chose wisely. 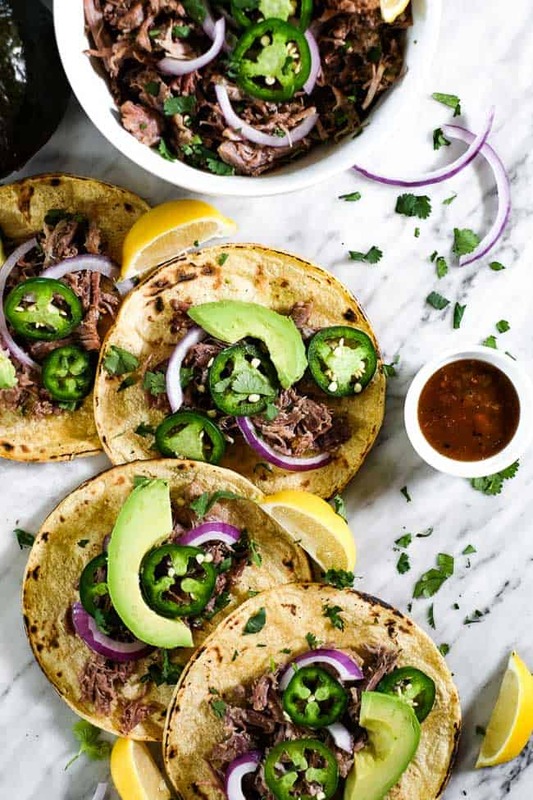 But…if you’re just staying Paleo you might go for some Siete tortillas (or even corn tortillas if you splurge once in a while like us – I know that’s not strict Paleo). I’m thinking next time we will have to make a pizza topped with this tasty pork! But you do you, and whatever makes most sense for your personal needs and goals. That’s what is most important! If you don’t already do some level of meal prepping over the weekend, we highly recommend it! It’s such a time and stress-saver during the busy work week. We like to make a big dinner Sunday night and have the leftovers in the fridge for the upcoming week! 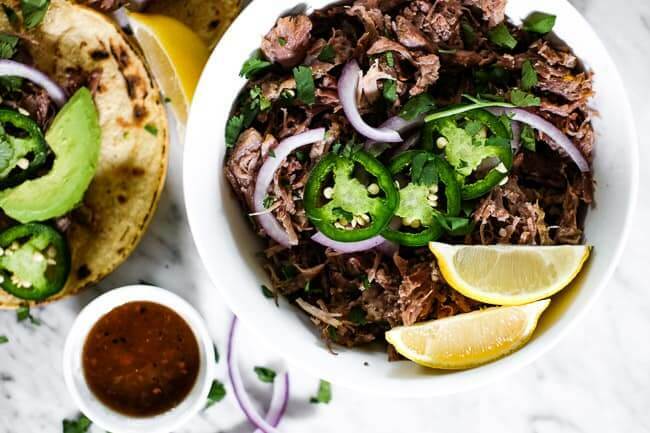 This mojo pork is the perfect contender for meal prep. It makes a large amount and is versatile! 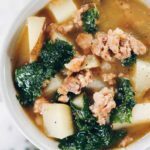 You can use it throughout the week for any meal of the day and pair it with different veggies, greens, etc. so it feels a little different each time! 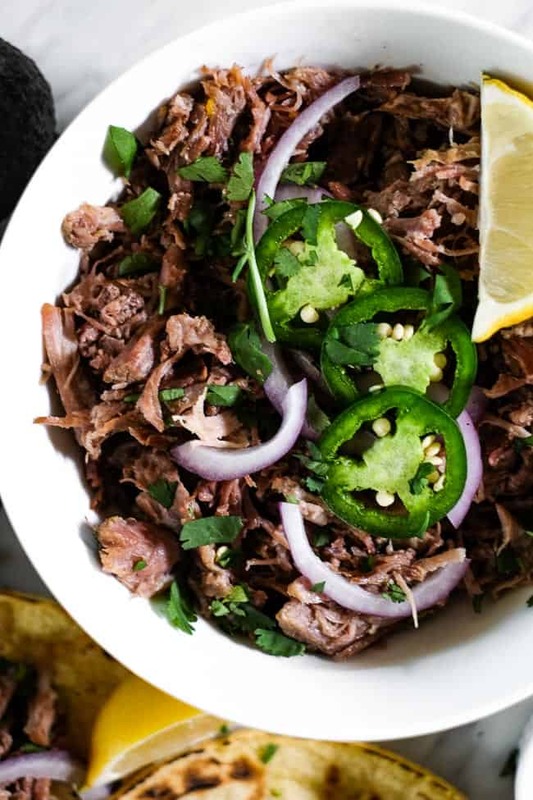 Go ahead and get this mojo pork on your radar! Make it this coming Sunday or anytime you want to have leftovers on hand or feed a little bit bigger group of people. Leave a comment below to let us know how it goes. Also, take a picture or video and share it on Instagram. Tag us @realsimplegood so we can check it out, and give us a follow if you don’t already! We’d love to stay connected! Cut pork into cubes and set aside. Prep onion and garlic as noted. Combine orange juice, lemon juice, cumin, oregano, salt and pepper powder in a bowl or jar and mix well. Press the sauté button on the instant pot and add ghee. Once hot, add in the pork and brown it on all sides. Press cancel on the instant pot once the pork is browned. Pour the juice/seasoning mixture all over the pork cubes and add in the diced onion and garlic. Secure the lid on the instant pot and close the pressure valve. Press the "manual" button (or "pressure cook" button) and set the time to cook for 30 minutes at high pressure. Once the time is up, let the pressure naturally release on its own for 20 minutes. Manually release any remaining pressure and remove the lid. Shred the pork with two forks. 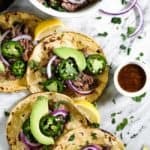 Serve the mojo pork in lettuce wedges or tortillas with your favorite toppings. Spoon some of the extra sauce from the instant pot over the pork for serving. Heat a large skillet over medium heat and add ghee. Once hot, add in the pork and brown it on all sides (you may need to do this in batches). 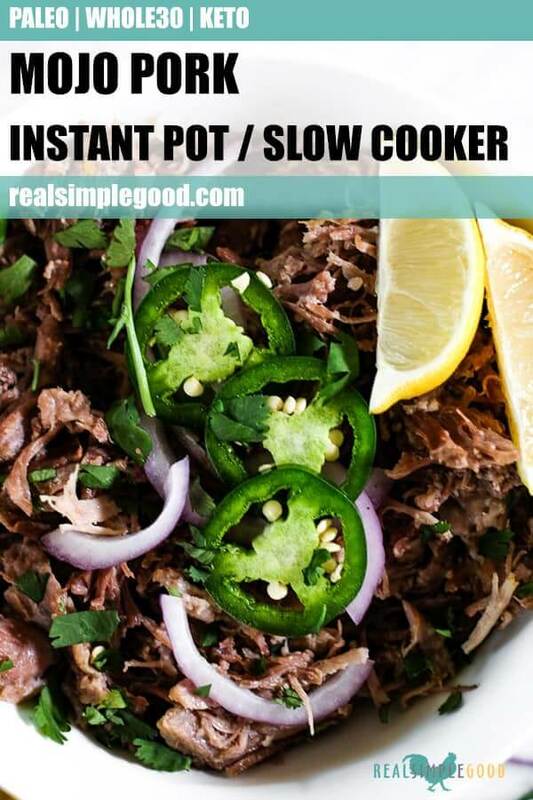 Remove pork and place it in the slow cooker. Cook on low for 8-10 hours. Remove the lid and shred the pork with two forks. 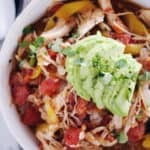 Nutrition facts are an estimate provided for those following a Ketogenic or low-carb diet and do not include optional toppings/serving items for this recipe. See our full nutrition information disclosure here.